FIRST OF ALL, THANK YOU FOR STOPPING BY AND A BIG WELCOME (OR WELCOME BACK) TO BELLYGOODNESS! THE ALL- NATURAL, GUT-FRIENDLY, LIFE CHANGING SAUCES! 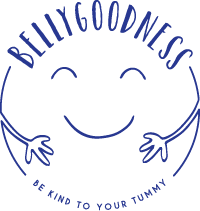 BELLYGOODNESS IS THE RESULT OF TWO MOTHERS & TWO DAUGHTERS COMBINING THEIR SKILLS AS NUTRITIONISTS & CREATIVE COOKS. WE PUT OUR HEADS TOGETHER TO CREATE A BRAND THAT WOULD OFFER YOU FLAVOUR PACKED FOOD WITHOUT ANY GLUTEN, YEAST, DAIRY, ADDED SUGARS, ONION, GARLIC OR TOMATO – ALL COMMON FOODS THAT CAN IRRITATE THE GUT. WE CAN HEAR YOU ALREADY – ‘HOW CAN YOU MAKE TASTY SAUCES WITHOUT ALL OF THOSE INGREDIENTS?’ WELL, WE FOUND BOB, STARTED COOKING & DEVELOPED YOU A DELICIOUS RANGE OF SIX SAUCES. KNOWING THE IMPORTANCE OF GUT HEALTH, IT WAS OUR GOAL TO NOT ONLY DEVELOP SAUCES THAT OPENED UP A NEW WAY OF EATING TO THOSE THAT ARE RESTRICTED BY CERTAIN INGREDIENTS BUT TO MAKE THEM SO TASTY THAT YOU WILL WANT TO SHARE THE GOODNESS WITH ALL OF YOUR FRIENDS & FAMILY. PACKED WITH VEGGIES AND ALL NATURAL INGREDIENTS, OUR WIDE RANGE OF SAUCES ENSURES THAT THERE’S SOMETHING FOR EVERYONE! VISIT OUR RECIPE PAGE FOR SOME MORE INSPIRATION! GAIL, FRANCESCA, PAULINE, CHARLOTTE & OF COURSE BOB! SPREAD IT OR SLAM DUNK DIP IT!